Unless your buying a home for all cash you’ll want to know what the true meaning of what mortgage interest rates are. Did you know that mortgage rates influence the overall cost of real estate and real property? When mortgage rates go up, traditionally home prices come down and vice versa. Think about this though, what if mortgage rates were down and home prices were also low, would that be a good time to buy? Absolutely, that’s why there are so many homebuyers right now because mortgage interest rates are at all time lows and homes are still priced to sell. Mortgage rates obviously fluctuate but in the past rates were as high as 18%! With rates as low as 3.5% as of writing this article it’s no wonder why the real estate market is on the mend. When rates are on the higher end it also stunts the market because it thins the amount of people who can qualify. Low interest rates means more people can qualify because the payment is lower and when the interest rates is lower it also stimulates the economy. Mortgage interest rates also known and referred to simply as interest rate is the cost to borrow money. Think of it like this, if you want to borrow $100,000 and the current interest rate is 3.5% would you want to borrow the money? Probably yes because the cost is fairly insignificant. What happens though when we add the 18% rate we were talking about earlier, that’s a whole different ballgame. Now you see why so many buyers are excited about the current real estate market. Low interest rates and low-priced homes, this opportunity doesn’t happen that often. There are different types of loans and in these loans are different repayment types. We wont be covering loan types today but the two most popular repayment types are a fixed rate mortgage and an adjustable rate mortgage. 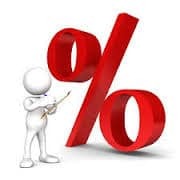 Fixed rate mortgages are mortgage interest rate loans that never change, for instance if you get a home loan with a 5.0% fixed rate then that 5.0% interest rate will be what you pay on your first payment and your last unless you refinance your loan along the way. One great thing about a fixed rate mortgage loan is that the payment never changes and so its easy to budget. Another type of repayment type is the adjustable rate mortgage or ARM, this loan often attracts it’s borrowers with a low fixed rate for a certain amount of time then the interest rate fluctuate based on the interest rate index and margin which is a value set by the lender. The low ARM introductory rate is typically for a few to 10 years and the rate is usually less than a fixed rate, be careful with this loan because when the loan adjust it can be detrimental to some borrowers. For more information on mortgage interest rates or to get approved to buy a home, please contact us. We’d appreciate the opportunity to assist you!